Here’s a DIY project that anyone can do. Give those cement bricks a new life by recycling them into flower pots. It’s easy and inexpensive. If you don’t have any laying around you can buy them for around $1.75-$2. each. Every year I always use annuals because I like to experiment with different varieties. This year is my favorite combination. Fibrous Begonia and Celosia. This is my fourth year using these bricks. For a step-by-step tutorial click here. Feel free to check out the previous years here and here. Here’s a few additional tips that I discovered along the way to save you some time. Right before the snow arrives, pull out the dead plants from the bricks. No need to cover them or change the dirt from season to season. Just let them sit as is. Use a tarp. It saves on cleanup time. If you have dogs, keep them away from the bricks. My three loved to “mark” one brick in particular. So much that their urine was trapped in between the spaces of the bricks. Gross right? I ended up switching out that one. Don’t worry about the excess dirt. As it rains it’ll wash away. I had four leftover plants from the flats I purchased for this project. I’ll share another easy project tomorrow on what I did with those. The Top 10 Link List is back! 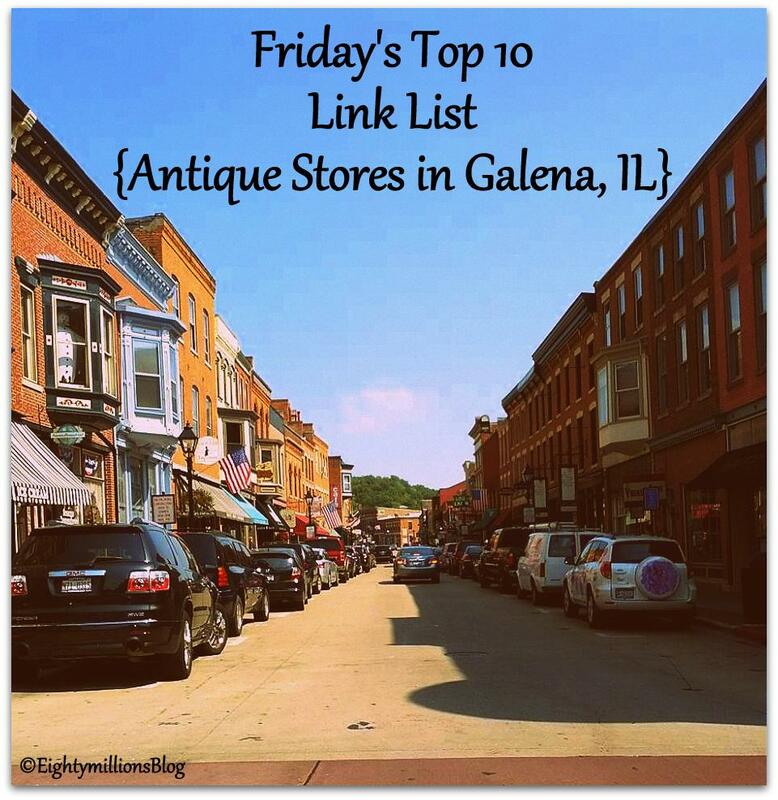 When’s the last time you took a walk down Main Street in Galena, IL? There’s been a lot of changes over the years, but one thing is for certain. Antique stores are making a comeback! Did you know that there are ten shops? Each one filled with an eclectic mix of timeworn treasures. Visit them all so you don’t miss anything. Here’s a preview of what you can find on your next trip to our quaint little town here in the Midwest. Don’t forget to utilize Visit Galena’s website with planning your vacation/weekend getaway. There’s also a new website featuring all of these shops. The creator is working hard on developing the site so that you have all the up-to-date information. Be sure to bookmark the page for future reference. I’m extremely excited yet overly tired. Honestly, I could fall asleep within 30 seconds of hitting the pillow. First I want to share an update regarding the Smash Books. If your new to the blog, *thanks* for visiting. Also, read here for the history behind this awesome handmade project. I’ve got three piles of cutouts ready to go. Huge piles. I surprised myself at how much I’ve collected for this. Every page in the book isn’t going to be the exact same size. Why? Because I hate to measure and I don’t want to take the time to cut again. I’ve spent enough time with the scissors for the prep work. And it doesn’t matter if they match. I’ve got an idea to make each page fit within the book. It was inspired by a child’s toy that I saw in the store. I’ll share more when I approach that step. I also kept the odd pieces from each box that I broke down. Not sure where they will fit in, but I couldn’t throw them away. That’s all folks. Girl needs sleep. Check back tomorrow for Friday’s Top 10 List (I’ve made new connections and found some goodies from around the web). On Saturday I’ll show you what supplies I’ve gathered to place in the books. Everyday oddities that are inexpensive yet creative. Today is the first day of July. And there’s no better time than to start those handmade Christmas projects than now. I’m trying very hard not to wait until the last minute with gifts this year. I have two nieces and four nephews who will love these smash books. I’m going to post updates as the project progresses all the way up till their completion. I invite you to create one along with me. Give one as a gift or a keepsake for yourself. There is a few things that I would like to say before we get started. First, if you Google smash books you will get a wide variety of options to look at. There are several ways to create one. Some may call them a scrapbook or a journal. I like Smash Book. I’m sharing my ideas with you for inspiration. There is no wrong way to make one. Let your imagination flow. I’ve seen some that focus on one particular subject or event. My creations are going to be collection of photos and oddities that my nieces and nephews will enjoy. They will all be signed and dated. As I type this I’m envisioning in my head that this may turn into a yearly gift from their Aunt Jennifer. We are living in a world full of technology. Agree? It’s nice to have something tangible to track your footprint. Are you with me? Second, I’m not promoting any of the product boxes that you see in this post. I’m recycling everyday products that we all have in our homes. The core of this project revolves around recycling. I’ve been collecting and saving all sorts of boxes for quite some time. Cereal, crackers, Mac & Cheese, fruit snacks, etc. If I can find a way to reuse something I’m happy. Another bonus is your production costs is low. The Secret Life of Bees. Have you seen it? I’ll be watching this tonight while I start this project. Perhaps I’ll order a pizza also. Too hot to cook and I don’t dare turn the oven on. The beginning is the most time consuming part. If you own a large industrial paper cutter than you can breeze through the prep work. I only use my paper cuter for cardstock, so using a pair of scissors will get the job done. I’m taking all of the boxes and cutting off the sides, top, and bottom. Those will get set aside for use later. The front and back will be used for the base pages of the books. I’m taking all of the cereal boxes and cutting them in half. This will be the general size of the pages for each book. Do I measure each page to make sure they are even? No. Once you get to know me, you’ll find that I don’t measure anything. To eyeball it works just fine for me. I have some ideas for combining various sizes in the same book. I’ll share that later when I get to it. That’s all for now. A Sunday evening with a movie, pizza, and a pair of scissors. My next update will come when I’m all done cutting. I have six books to make so I want to get the most gruesome part done all at once. If I can inspire you to make one, you are awesome! If your here to read along, you are awesome! My muse sings a river of ideas to me daily. And if I can create something interesting and inexpensive, then I want to share it with you. I would love to hear (see) from you if your participating in this project. Leave me a comment below. You can also communicate through my Eightymillion page on Facebook. I can honestly say that this recycling project is my favorite (so far)! My Mom found these awesome vintage beverage crates at a garage sale and gave me three of them. I wish I had more of these because they would make an awesome gift. My eyes will be wide open on my next picking adventure. Remember the other two I used to create an end table in my living room? If you missed that post, click here. Supplies that I used for this project: One crate, polyurethane, foam brush, disposable gloves, cardboard from the recycling bin, and a plant. The box clearly has a “vintage look” in it’s natural state. It’ll go outdoors, so that’s where the polyurethane comes in. I wanted to add some additional protection for the crate itself. You can see from the picture below that it already has a built in drain on the bottom. I sanded it down a bit first before painting it. I went with the Fast-Drying Semi-Gloss. Worked like a charm. I was surprised to find these pink double impatiens at 50% off already. Scored two plants for $5.49 each. I used the other one for another project. Full of color and lots of buds ready to bloom. I pulled a box out of the recycling bin to use as my work surface. Using a foam brush and disposable gloves I applied two coats of the polyurethane. Highly recommend doing this outdoors due to the fumes. I applied extra to the interior bottom of the box, since this will be where the plant will rest. I painted the box in the morning and by the time I got home from work that afternoon is was dry and ready to go. I snipped the wire hanger off that was on the plant. The container fit perfectly down into the box. Who measures anything? Not this girl. Usually I just eyeball it. I thought about replanting in the box, but after some consideration this way works just fine. And there’s no mess. Enjoy what is left of this comfortable and cool Friday evening. Excited to be heading to the local farmers market tomorrow. Perhaps I’ll have another “What’s On My Plate” recipe to share with you. Due to my previous work schedules I was unable to attend last year. Rain or shine, I will be there in the morning! I’m in the process of gathering all my supplies to make some domino jewelry. Yes, a lot of people make them. There’s also a lot of card designers out there as well. Hasn’t put a wrench into my creativity. We all have our own personal style. 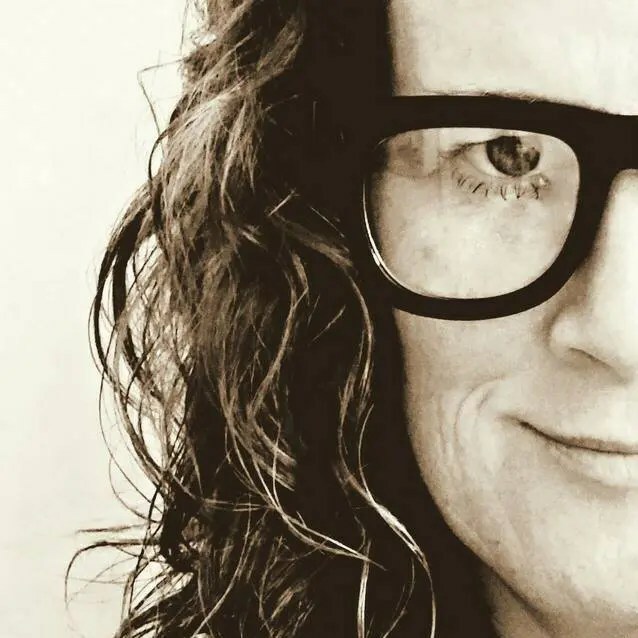 I share my stories and projects with you in hopes to give you inspiration and maybe trigger your creative talents. Or perhaps just to entertain you with my crazy dog lover stories. Either way I’m happy your here. Being a handmade artist has many benefits. First, it makes gift giving all the more fun. I have two nieces and four nephews to spoil. They are my very own little testing market for all things handmade. Have you ever given a gift and the recipient asked where you got it? Remember the look on their face when you told them that you made it. Both priceless and rewarding. Second, it’s a BIG stress reliever. I saw this quote used as a tattoo, “Art is the solution to chaos”. So true! Third, if you can mix recycling in your work, it’s a win-win situation. I could go on and on with the benefits. Okay, back to the jewelry. I came across two vintage sets at a flea market, one black and the other ivory. At first I was going to use them to outline the edges of my recycled tire table that I have on my deck. If you missed that post, click here. I’m still looking for ideas with that project. Not sure what I’m going to put on the dominos. Photos, quotes, embellishments. Brainstorming ways to incorporate the number of dots on one side to match the theme on the other side. We’ll see what I come up with. P.S. I scored this really cool metal pantry cabinet at a garage sale last weekend. I’ll share the pics and the story next time. I must find a place for it in my studio. I had these two plastic flower pots taking up space in my storage area “aka” the garage. They have a unique vintage look to them. In the process of cleaning out the garage I thought of a way to reuse them and save them from the garbage. I flipped one of them over and used three screws to connect them. Now I like them again. I recently replanted a shrub that was growing out of control in one of my flower beds. I noticed that I forget a portion of the plant in the ground, so I’m attempting to give some life. So far so good. It’s been very cold and damp here. Not to mention the amount of rain we’ve been getting. Perfect weather if your a vampire, but I still have some weeding to do in the garden. In the meantime I’ve got some additional outdoor projects that need some attention. This is a continuation to my earlier post, Outdoor Recycling Inspiration. If you missed it, click here. I had planned to share a collection of the other projects after their completion. Due to Mother Nature’s inconsistency I’m only able to work on one project at a time. Last summer I asked a local dealership for four used tires from him. He looked at me kinda funny. I explained to him what the plan was. He picked out four and loaded up my trunk. He wouldn’t accept any money for them. Instead I went back there this past winter for two new tires. This will also allow me to make another tire table with the old tires. I used three for the base of the table. My dad and uncle usually have odd pieces of wood sitting around. I took measurements for a table top and a piece was cut. It looks bare. Needs some color and design. Wouldn’t you agree? Old colorful rulers? Mosaics? Handwritten quotations? Magazine clippings or newspapers? Although they won’t hold up being outside. I’m taking suggestions here. Something to give it a vintage look. Leave me a comment below. I’ll post a follow-up when it’s completed and I’m enjoying lemonade on my deck. Here’s my latest project I’ve been working on. Remember the sneak peek I gave you earlier this week? I used the original 1967 vintage flash cards, some card stock, and a frame. The box came with 144 words to work with. I was going to sell the box of cards as is, but as I got looking through them I was coming up with all sorts of phrases. My mom convinced me to frame some. A few will go in the shop in Galena, IL, some on Etsy, one will be for a gift, and a couple in my house. Here’s a flash card that I got from a set my mom has. Having a house full of four-legged ones I felt it fits most appropriately on my office wall. Until the next project……have a funday Monday!